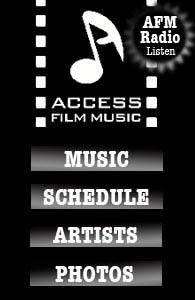 Access Film Music Ltd. was established to connect music-makers with film-makers. We achieve this through several avenues, including live music showcases, music compilations, and direct, personal networking. Our mission is to assist recording artists, composers and songwriters in establishing connections with film-makers and other media. Launched in 2004 and originally named "Radical Rat", over the past 10 years, our Access Film Music Showcase has presented hundreds of exceptional recording artists to members of the film industry during Film Festival Week in Park City, Utah, including national and international touring performers, multi-platinum recording artists as well as exceptional unknown, emerging songwriters and composers. Our event, artists and sponsors have received widespread acclaim and coverage on TV and radio, and in newspapers and magazines. Access Film Music Showcase is presented at The Spur Bar & Grill, an intimate venue located directly on Main Street in the heart of downtown Park City. During Film Festival Week, Park City is overrun with members of the film industry who are there to participate in some of the biggest, most important North American film festivals, as well as several smaller film festivals and competitions. To be considered for a showcase opportunity at the Access Film Music Showcase, please click here or click on the "Perform" link, above. © Copyright 2008-2012 Access Film Music Ltd.